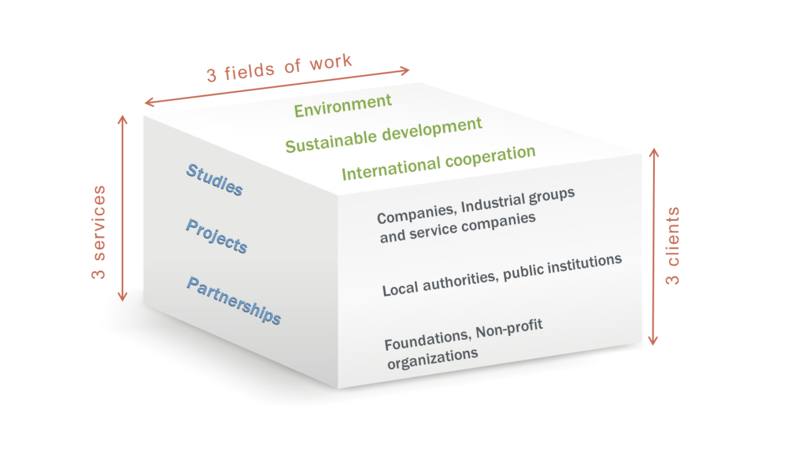 three types of clients (companies, local authorities and public institutions, foundations and non-profit organizations). Since its creation in 2002, Nomadéis has carried out 120 assignments in 42 countries involving many actors and public and private decision makers. Throughout these references Nomadéis’s team has acquired a concrete and broad experience of the local and global issues of sustainable development. International cooperation : corporate patronage strategies and programs, international action of public authorities. Studies: a good understanding of the context of an action is the key to making the right decisions. Nomadéis produces mappings of actors and of risks, establishes socioeconomic diagnoses, carried out feasibility studies, analyzes sectors of activity related to green economy to improve their performance, thanks to acute know-hows and well-adapted tools. Projects : Since its creation, Nomadéis has insisted in keeping an operational dimension to its offer, to support its clients on the field during operational implementation steps. Development programs (access to essential services, capacity building…), local Agendas 21 programs, organization of conferences… Nomadéis’ team is mobile and multilingual. Partnerships : the present issues linking the environment, sustainable development and international cooperation call for a diversity of skills. Nomadéis supports its clients in setting up strategic partnerships between companies and United Nations agencies, between foundations and public institutions, and between local authorities ans non-profit organizations. For companies, optimizing the management of scarce resources (water, energy…) leads to cost reduction, ensures a continuity of activity, frees new resources for innovation, and improves the image of the company. The development of an eco-friendly offer encourages differenciation and the conquering of new markets. Taking into account general interest is essential for sustainable prosperity. For local authoritues and public institutions, the definition of sustainable development strategies for territories (local Agenda 21, ecodistricts,…) are opportunities to engage vast participative diagnoses, to anticipate mutations and to plan tomorrow’s balances. Operations encouraging a green growth contribute to the revitalization of sectors of activity and to the development of jobs with added environmental value. Foundations and non-profit organizations face new challenges to ensure a well-adapted governance, to mobilize stakeholders (advocacy, cooperation, awareness-raising…) and to establish a lasting financing of sustainable development in the North as well as in the South, thus contributing to the Millenium Development Goals.